New in Riot's 2019 line-up, the Mako SOTs are available with or without the new Impulse Drive pedal system, as well as in an angler version with Impulse Drive. This kayak has an Ocean Design: Massive flare on the nose to cut through those; I'm gonna take all your gear waves. Simply escape with the Vibe Yellowfin 100 kayak. The Yellowfin 100 has all the features anglers demand like extra rod holders, large rear tank well, adjustable foot braces, front and center hatches, tackle tray holders and a mounting point for Scotty, RAM and Vibe mount accessories. Condition is Used. Two b o a t s a r e available. One a l l blue a n d the other i s white a n d blue v a r i e g a t e d.
MODEL: J2020. LARGE BALLOON TIRES. Balloon Wheels: 11.8" x 7". It folds compactly for storage and fits even the smallest car. Assembly Required - Tire Inflation Required. Detachable beach wheels dark grey color. 4 x Wall Mount Kayak Rack(Kayak not include). Each hanger rack with 2 PVC pipe sleeves. Net Weight(approx): 2.6 Lbs (1 Pair). Steel construction. Can be foldded to the side when not in use. We are committed to resolve all issues in a friendly and satisfactory manner. 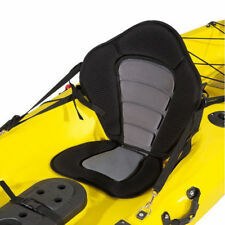 This item is designed to fit most kayaks and canoes, this high quality kayak seat is the best one for enhancing comfort while you're paddling away and exploring in the waters.This non-slip contoured padded seat surface and a high backrest design adds extra comfort and safety while you're out and about in the waters. Fishing Kayak Sport Fisher. This is a great Fishing Kayak for the price ! Paddle holder. Two flush mount and one swivel fishing rod holders. Great for lakes and rivers and to get to those excluded fishing spots. B lue Water 2 in 1 Inflatable Stand Up Paddle Board and Kayak. KAYAK AND SUP IN ONE. The lightweight portable design with extra large comfortable EVA non-slip pad for safety is a breeze to take anywhere. Tamarack Angler Kayak - The 120 in. adult kayak has a 275 lb. 5-year limited warranty. proposition 65 reasons:CA PROP. 65 WARNING: This product can expose you to chemicals including Nickel, which is known to the State of California to cause cancer and birth defects or other reproductive harm. We stand behind our products. All faulty due to improper installation or improper use will NOT be covered by the warranty. This 10 foot Sit On Top Flat Water Lake Kayak is the perfect size for adults & teens. It easily fits in an average-sized garage, storage shed, or closet. Lake Kayak Sit On Top. Paddle & holder. Fishing rod holders - (2) flush mount & (1) swivel. Includes our SE370 Sport Kayak, (2) AB30 paddles, (2) inflatable movable & removable DKS seats, foot pump and carry bag with convenient shoulder strap. Easily portable, it carries upto three people and gear, but can be transported and used by one adult alone. 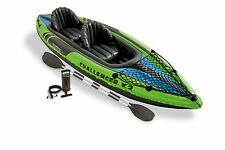 Tamarack Angler Kayak - The 120 in. adult kayak has a 275 lb. 14.5 Ft Perception Carolina Sea Kayak. Kayak is in good used condition (only used a handful of times). Kayak has two large waterproof storage compartments and the optional foot controlled folding rudder. 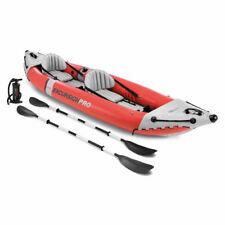 It comes with a paddle, Medium/Large adult life jacket, cockpit pump, large waterproof bag, and foam roof rack supports. Local pick-up only. klepper aerius double kyak . Condition is Used. Shipped with UPS Ground. 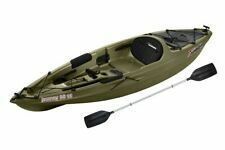 Lifetime Tahoma 100 Sit-On-Top Kayak (Paddle Included), 90816. Condition is New. Shipped with USPS Retail Ground. Forest green. The Lifetime Tahoma Kayak is a "sit-on-top" kayak that has a comfortable backrest for your long paddling adventures. Designed for extreme safety and stability, the Tamarack™ has a stable flat bottom with deep tracking channels and stability chine rails. The kayak is constructed of blow-molded high-density polyethylene (HDPE) making it durable, UV-protected, and impact resistant. The lightweight, 50 pound design and front and rear carry handles make it easy to transport to and from the waterfront. With a storage hatch, paddlekeeper, and multiple footrest positions, this kayak has plenty of "extras" to enhance your paddling experience. New ListingSea Eagle 370 Kayak. Purchased 2 years ago. Never been in the water. Sea Eagle 370 Kayak. Purchased 2 years ago. Never been in the water. .
4.5 out of 5 stars - Sea Eagle 370 Kayak. Purchased 2 years ago. Never been in the water. 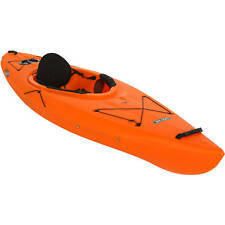 44 product ratings44 product ratings - Sea Eagle 370 Kayak. Purchased 2 years ago. Never been in the water. Adjustable step-lock foot rests for ultimate comfort. Blowmold unibody dihedral hull. Extra large cockpit for easy entry and exit. Ergonomic adjustable padded seat. Includes paddle. The cockpit is non-confining and surprisingly roomy. The Sea Eagle 370 has a carrying capacity of 3 people or 650 lbs. You can carry enough gear for that long weekend trip of fishing, exploring or river running. This affordable inflatable sport kayak is as lightweight and portable as it gets, yet still remarkably stable and durable. 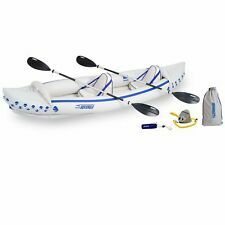 4.5 out of 5 stars - SEA EAGLE 370 PRO PACKAGE INFLATABLE 12.5 FT KAYAK NEW FACTORY SEALED 3-YR WTY! 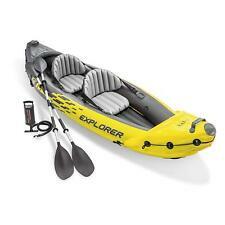 44 product ratings44 product ratings - SEA EAGLE 370 PRO PACKAGE INFLATABLE 12.5 FT KAYAK NEW FACTORY SEALED 3-YR WTY! Kayak Drain Plug for Sundolphin Kayaks. Excursion 10. Never used, garage stored, Wilderness Systems Tsunami 125. Accessories also available. Bought this with the idea of making kayaking my hobby, but have taken up biking instead. Paddle holder. Great for lakes and rivers and to get to those excluded fishing spots. Two flush mount and one swivel fishing rod holders. Adjustable foot braces. Trending at $367.16eBay determines this price through a machine learned model of the product's sale prices within the last 90 days. Kayak w/ Paddle Single Person Sit On Top Boating Sea Ocean Lake Fishing New. Condition is New. Local pickup only. The 220 cm Blackjack Paddle has a durable aluminum shaft with black polyethylene blades. It features a two-hole button system with 0-degree and 45-degree right or left handed feather positions. This is a great entry level paddle. Weight capacity. Black double-sided paddles are included (1063135). 5-year limited warranty. Molded finger handles on each side of the kayak. Molded paddle cradles. Weight: 18 lbs. Lancer Kayak - The 10 ft. kayak has a 275 lb. Blow-molded with a 5-year limited warranty on hull. Lancer 100 Sit-In Kayak Features Ledge Lock Paddle Keeper for Easy Paddle Storage. Front and Rear Handles for Easy Transport. Limited edition design with Tree Print. - Folds to fit a car truck, closet, garage, etc. - Material is 5mm polypropylene. - Takes only minutes to fold and unfold. Weight Capacity (lbs). Hatch Capacity. Number of Paddlers. Padded / Foam. Cockpit Size. The Echo iKayak from HO Sports is the kayak of choice for adventure seekers wanting an easy to use, lightweight inflatable kayak. The Echo’s 3 inflation chambers make inflation/deflation a snap while the RIGID Drop-Stitch floor won’t bend or fold like many other inflatable kayaks. For over 4,000 years, people around the world have used kayaks on rivers, lakes, and oceans. Whether you are fishing for dinner or exploring a beautiful natural waterway, a traditional or fishing kayak can be a useful and enjoyable mode of transportation. How do you choose a kayak? Carefully consider these factors when selecting your boat. Your kayaking location: It is helpful to know if you will be using your boat and paddle on small lakes or large oceans. In rough areas, you need a maneuverable boat that will not tip while a stable boat is helpful if you are mostly going fishing in your kayak. Your partners: Decide whether you want to go alone or with a partner before you get the boat. Your skill: Wider boats are more stable in the water while long, narrow vessels tend to be more maneuverable. Sit-on-top boats have holes that drain off water, making them self-bailing. Local weather: Users tend to get wetter in sit-on-top boats, so check local weather and water temperature when choosing your kayak. What are the dimensions of a kayak? Dimensions will vary depending on which type of boat you select. Long-distance options tend to be between 16 and 19 feet in length. Playboaters who want to do tricks require a highly maneuverable boat that is about 5 to 6 feet long. Boats for use on whitewater rivers are generally around 8 feet in length. A fishing kayak measures between 10 and 13 feet long. What are the differences between kayak types? These are some of the categories of watercraft that are available. Some of them are in the sit-on-top kayak category while others are sit-in style. Traditional: A single paddler sits inside this type of recreational kayak. Sit on Top: This type allows you to sit on top to paddle. Two Person: A longer option, sometimes referred to as a tandem kayak, it has space and rod holders that allow two passengers with paddles to fit. Inflatable kayak: Inflatable kayak options can be collapsed for carrying and storage. Kayak: Sometimes called an angler kayak, this boat is used for fishing or hunting. It has space for extra gear and paddles. What are kayaks made from? The material used to create the watercraft and paddles can affect the weight and maneuverability of your kayak. These types of boats come in many different materials, including the following options. Wood: This material is lightweight, and is suitable for kayaking in still or calm water. Fiberglass: Fiberglass is frequently used because it’s lightweight. Polyethylene: This is a form of plastic that can be used to create molded boats with paddles that are larger and heavier than the typical option. Synthetic composites: There are a variety of other synthetic materials that can be layered to meet a range of specifications. Some composite options for kayaks and paddles include styrene, ABS, and graphite fibers.